The teddy bear. It’s almost a rite of passage for a child to grow up with one. From taking it to bed for comfort when darkness takes hold, to toting it to daycare, it’s a friendly, soothing companion. Toy bears may have been made by hand for children before the turn of the 20th century, but the name Teddy came by way of President Theodore Roosevelt. On a hunting trip in Mississippi in 1902 that had thus far been unsuccessful, Roosevelt refused to shoot a defenseless bear that had been tracked and wounded and tied to a tree by guides. He, instead, ordered the injured bear be put down. Another very similar version of the bear was being manufactured in Germany by seamstress Margarete Steiff in her family’s factory. Modeled after drawings done by her nephew Richard, Steiff designed the toy bear to have a friendly look. It was covered in brown mohair, stuffed with excelsior (packing material consisting of wood shavings) and had hinged joints. The bear’s moveable head, arms and legs allowed it to be put in a sitting or standing position. Shoe-button eyes, an embroidered nose, cloth soles and felt claws completed the toy. Shown at a German toy fair in 1903, the Steiff bears were spotted by an American toy buyer. He ordered 3,000 and the worldwide teddy bear craze began. These bears – now worth tens of thousands of dollars – are treasured by collectors, if they can find them. Today, one of the most loved and collected bear lines is Boyds Bears. Founded in 1984 by Boyds, MD antique shop owners Gary and Tina Lowenthal, they initially sold antique reproductions. After coming upon a Chinese line of 100 percent Merino (breed of sheep) wool bears, Lowenthal designed one of his own – 12 inches tall with moveable joints – and named it Matthew, after his infant son. 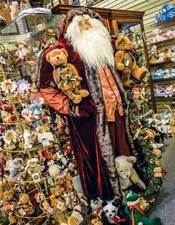 With its company moved to Gettysburg, PA, the 1990s saw Boyd resin collections of bears, other animals, santas, Faeriesprites, treasure boxes, etc. In 2008, giftware company Enesco bought the rights to Boyds, maintaining Boyds craftspeople that created limited edition items. If you have any of these pieces, you might want to hold on to them. Boyds Bears were put into hibernation by Enesco at the end of last year; they are no longer produced. A great place to find these collections, as well as sports memorabilia, dolls, and characters from Walt Disney, The Wizard of Oz and Winnie the Pooh – basically anything that conjures up thoughts of childhood – is at Classic Art Gift Gallery in Concord. Owners Joe and Susan Panko have surrounded themselves with an inventory that boggles the mind and fills the senses. Panko has a few of his own memories, too. “I remember one Christmas when I got three wonderful toys and none of them worked…no batteries. I got a plane that you put fuel in then start the propeller. It flew around twice and caught on fire. I got a pair of roller skates that fasten to your tennis shoes. I fell three times and thought my parents were trying to kill me. At holiday time, Panko says favorites include angels and Jim Shore resin sculptures. Throughout the year, Disney, Gone with the Wind, Wizard of Oz, and Charles Schultz’s Peanuts characters are crowd pleasers. Not surprising, with technology has come a change in gift-giving trends. “Children today are split: 75 percent electronic and 25 percent other gifts,” Panko explains. “Friends who have children say, ‘Johnny wants something electronic.’ After they get their electronic gift, they get very excited about a piece of sports memorabilia. However, the girls love getting a soft friend for their collection. We’re more and more filling needs for non-electronic gifts. And while shoppers in the 1990s collected Boyds Bears, sports collectibles and Beanie Babies, “Today, the stuff that has stood the test of time are Boyds Bears, Beanie Babies, Cabbage Patch Kids and Coca-Cola items,” Panko says. “The most popular in our store today are still Boyds Bears and Jim Shore items…and when the Panthers are winning, Panthers memorabilia. Regardless of what’s popular in 2015 or may increase in value over the years, what seems to strike a cord are the items that evoke memories of loved ones, and days that we didn’t realize were so simple until they were gone. But a visit to see Joe at Classic Art Gift Gallery could certainly make for a trip back down Memory Lane.